Eagle Canyon Arch is located in the southern section of the San Rafael Swell west of Green River, Utah. The trail follows an old jeep road that travels through Eagle Canyon between the Swasey Cabin and Interstate 70. The canyon is open to high clearance 4x4 vehicles but if they are much wider than a jeep they might not be able to make it around a few of the obstacles where the road is either washing out or partially obstructed by rock falls. ATVs and such should have little trouble finding passage. The trailhead is right at the Swasey Cabin site where a restroom is available. To get there follow the directions to the Lone Warrior Panel. From that trailhead there are signs pointing the way to the Swasey Cabin which is only about a mile away. The road starts out easy enough as it makes its way by the trailhead for the Ice Box Foot trail. From there the road begins descending into Eagle Canyon. It will gradually lose almost 500 feet of elevation between Swasey Cabin and the arch. This picture might be one of the roughest sections of the road. As you can see it isn't all that bad and it isn't necessarily typical of the rest of the road. There is one large rock that has rolled onto the road on one of the hills that if someone manages to move out of the way would probably make it easier for wider vehicles. The scenery along the way is such that it makes for a very pleasant excursion. A little before the 2 mile point there is another road, Trail #822, that comes in through a side canyon and connects on the left. There is a nice primitive campsite back in the trees near this junction. For the last half mile to the arch the road spends most of its time in the gravely wash.
As the road reaches the Eagle Canyon Arch it leaves the wash and climbs on top of a little rise where there is another primitive campsite and room to turn around. Scrambling up to the base of the arch reveals just how rugged and precarious looking it is. The trip back out of the canyon might be even more scenic if that is possible. This was our first trip into Eagle Canyon so we opted to park at Swasey's Cabin and hike it. These photos were taken around the middle of November. It can get very cold at night this time of the year up here on top of the Swell where the elevation is above 7,000 feet. 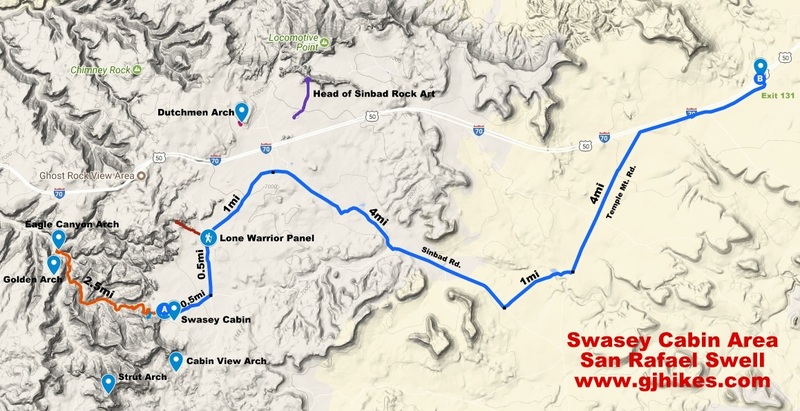 In our opinion the hike into Eagle Canyon to the arch was worth the trip all by itself although we did also check out the Swasey Cabin and Icebox Foot trails as well as the Lone Warrior Panel. If you would like to see it for yourself then all you have to do is 'Take a hike'.